05′-09′ Subaru Legacy BP Sunroof Delete – Officially For Sale – Northwind Composites, L.L.C. Two weeks ago we had the distinct pleasure of traveling to Seattle and spending a morning installing the first carbon sunroof delete in a beautiful 05′ GT wagon that is receiving the full track prep. We spent a bit of time listening to good music, installing clips, final sizing the insert, and generally just having a good time. After the insert was sized we were able to scribe the mold with the correct part periphery. Now that the scribes are in the mold, we can comfortably sell these knowing they’ll drop right in and they are officially for sale. Unfortunately, we had to leave before the bonding and sealing could take place. However, that has occurred and we have the first picture of the final install. Kip, you have a beautiful car and thank you for all the hospitality! 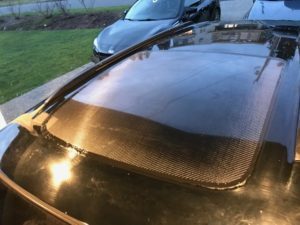 05′-09′ Subaru Legacy BP Sunroof Delete – Operational!